After 30 minutes on the canyon floor, board your helicopter to return to Las Vegas on a slightly different route that affords excellent views of the Las Vegas Strip. After your 45-minute return flight, transfer to a limousine and end your 3.5-hour tour with a ride back to your Las Vegas hotel. Discover the Grand Canyon on a morning, afternoon or evening helicopter flight from Las Vegas to the West Rim that descends into the canyon. On your way to the Grand Canyon, fly over popular attractions such as the Hoover Dam and Lake Mead, as well as the Black Mountains, Grapevine Mesa and Grand Wash Cliffs. Your helicopter heads 4,000 feet (1,219 meters) down to the canyon floor for close views of the rock formations. Eat a light picnic lunch with Champagne before your return helicopter flight over the Las Vegas Strip. This small-group tour is limited to six people for a more luxurious experience. Your deluxe morning, afternoon or sunset helicopter tour of the Grand Canyon begins with limousine pickup from your Las Vegas hotel. 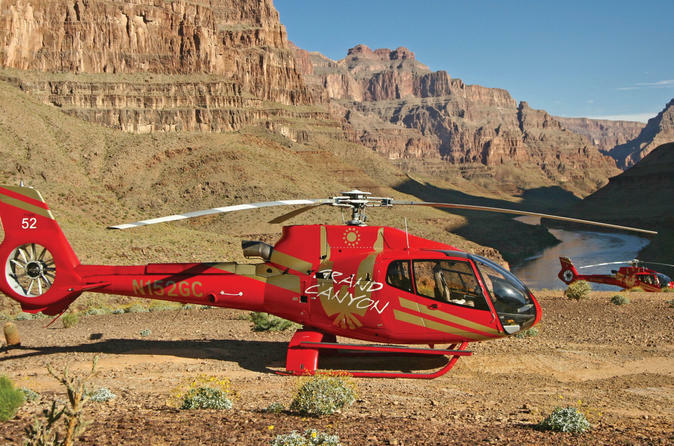 Arrive at the helipad and board your comfortable EcoStar helicopter for the 45-minute flight to the West Rim of the Grand Canyon. Admire the Black Mountains, Grapevine Mesa and the Grand Wash Cliffs as you approach Grand Canyon West. Take in unforgettable views of the steep canyon walls, and take photos as you descend 4,000 feet (1,219 meters) to the canyon floor. After landing, walk around and enjoy a light picnic lunch of sandwiches, fruit and beverages. Enjoy complimentary Champagne and toast your adventure with your small group. After 30 minutes on the canyon floor, board your helicopter to return to Las Vegas on a different route that affords excellent views of the Las Vegas Strip. After your 45-minute return flight, transfer to a limousine and end your 3.5-hour tour with a ride back to your Las Vegas hotel.